Here are two very easy and Delicious sandwich ideas for a healthy lunch!! Prepare tuna salad. Assemble sandwiches. Whisk egg beaters, milk, and pepper. Lightly spray griddle or fry pan with olive oil. Preheat. 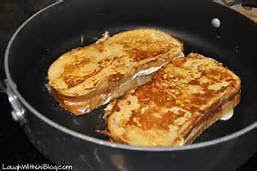 Using double spatulas, one on top and one under sandwich, dip in mixture and fry until golden brown. Turn. Serve when second side is browned. Bon appetit! Hearty and healthy in less than 10 minutes! Bake Naan for 2 minutes at 400°. Heat lentils for 1 minute in microwave on high. Spread lentil mixture on Naan, top with mozzarella and parmesan cheeses. Broil for 2 minutes or until browned.